I don't think you know but I really like LILFOX products. When I first tried them I knew they were special and so I was really excited to get my hands on the new October Beauty Discovery by Beauty Heroes. 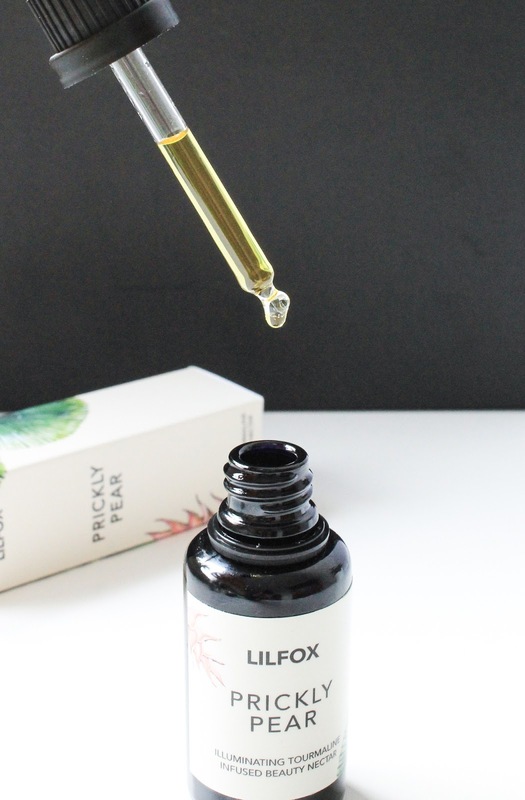 Of all the LILFOX products I've tried my favourite has to be Jungle Glow Enzyme Cleanser + Mask (review here) and I also really like Cupu-Cool Rainforest Moisture Jelly Balm* (review here). Oh and I loved the body oil that was featured in the Art or Organics box, the Flowerball Body Nectar* (review here). LILFOX is a beautiful brand, both on the inside and outside. It was created by Alexis Rose aka Madame Fox. Alexis hand blends her precious skincare formulas in micro-batches. She uses lots of organic and wildcrafted exotic virgin oils, unrefined butters, rare earth clays and high vibration hydrosols. She infuses her luxurious products with essential oils, crystals and vibrant plant energies. 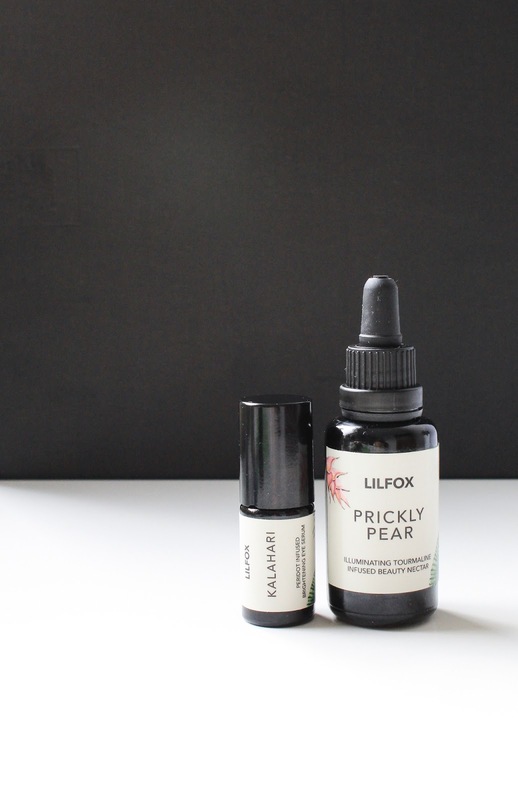 In the October Beauty Discovery* are two LILFOX products: Prickly Pear Illuminating Beauty Nectar and Kalahari Brightening Eye Serum. You can check it out here. 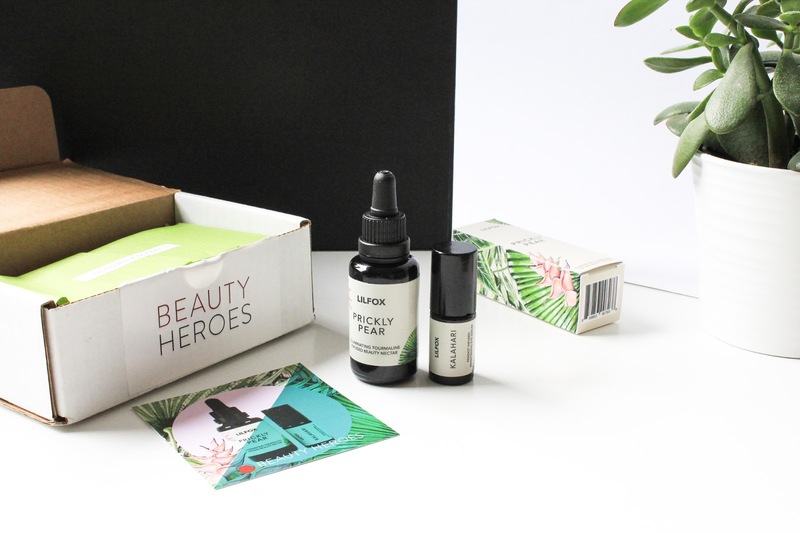 Let's start my introduction to this box and these two products with the Hero, the Prickly Pear Illuminating Beauty Nectar. At Beauty Heroes they intentionally didn't include many facial oils in their curations in the past few months so I was happy to see this beauty. This oil contains 12 ingredients, such as Prickly Pear, Passionfruit, Grapeseed, Hemp Seed, Pomegranate, Raspberry, and more. 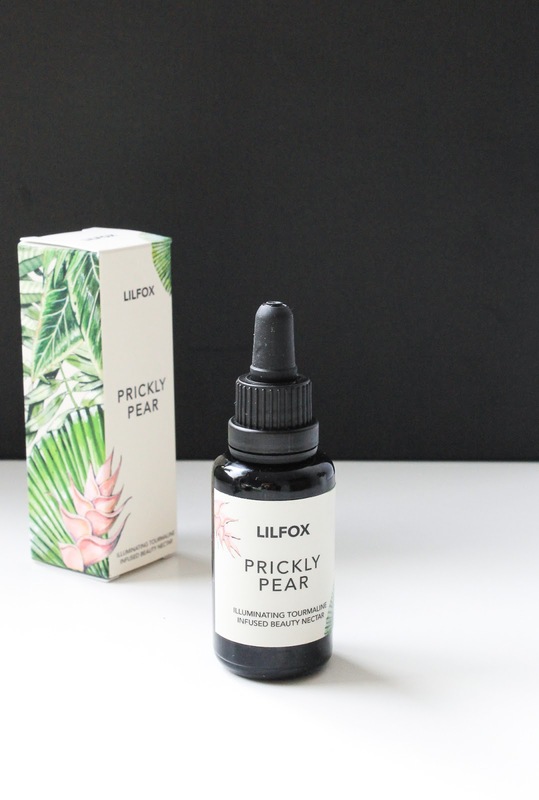 The star ingredient is of course organic certified Prickly Pear Seed Oil, which has a high amount of vitamin E and is rich in anti-inflammatory linoleic acid which balances oil production and discourages blemishes. 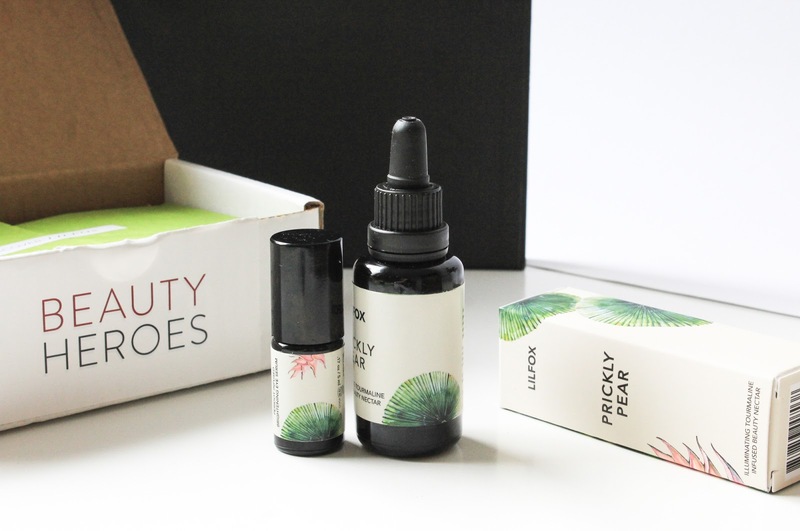 They source their prickly pear seed oil from an eco-cert organic farm in Morocco and the oil used for this Beauty Discovery was pressed fresh in July! How amazing it is to have such freshly made products?! That's just one of many reasons why I love natural & organic beauty products. Although the prickly pear seeds are very small (it takes a massive 8 tons of prickly pear fruits to produce just 1 liter of oil) and is the most expensive fatty oil in the world, the prickly pear cactus is an incredibly sustainable crop. In the Beauty Nectar is also Prickly Pear Fruit Extract (mixed in Sunflower Seed Oil), which makes the facial serum that more potent. I love the scent of this oil, it smells like Jasmine and I'm all about that. Mmm it's so dreamy & calming, and I really do love it. There is also Bergamot, Sandalwood and Frankincense. The oil is infused with Tourmaline crystal, which is said to align our energies with the earth, and it energizes and balances chakras. The Illuminating Beauty Nectar is quite lightweight and is said to be great for all skin types, especially dull, dry, mature, oily and congested. I have combination skin and it really feels lovely on my skin. The oil promises to brighten, even skin tone and deliver the perfect amount of moisture. I have only used it a couple of times but I can say that it doesn't clog my pores, it does help to even skin tone and is moisturizing. I've only been using it in the evenings and whenever I use it my skin always feels and looks lovely the next morning. It does give a subtle glow to my skin but I'm also very curious if everyday use will help to brighten my skin. I will continue using it to see if it truly delivers on its promises. Initial impression is that my skin really likes it and I think it's a very lovely oil. You can check out Prickly Pear Illuminating Beauty Nectar here. 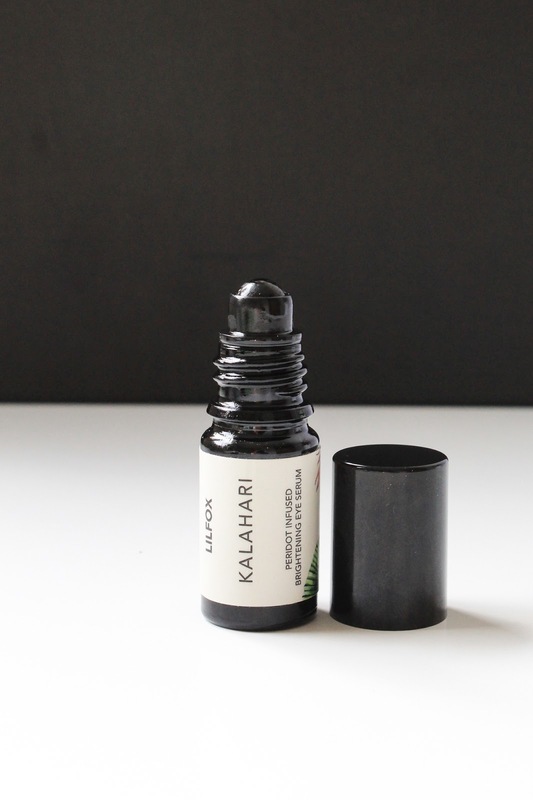 Kalahari Brightening Eye Serum is the Sidekick of the LILFOX Beauty Discovery. This little gem's base oil is Argan Oil, followed by Watermelon, Pomegranate, Rosehip, Passionfruit, Meadowfoam and Prickly Pear Seed Oil. It has a very subtle scent of Sandalwood and Rose, I can hardly smell it. I love that actually. I much prefer products, especially eye care products that have a gentle, non-invasive scent, if any scent at all. Kalahari is infused with Peridot crystal, which is this beautiful green gem. This eye serum has a very convenient roller ball application and I find that one or two swipes are perfect. I swipe it on and then gently tap the serum into the skin under and around my eyes. The oil is very lightweight so I can easily use in the morning, under makeup. In the evening I like to apply both, the eye serum and facial serum around my eyes, because I feel like I need a bit more moisture. I have been using it two times a day for about a week but I think that from now on I will only use it exclusively in the mornings (I really do love its lightweight consistency) and use something a bit heavier in the evenings. You can check out Kalahari Brightening Eye Serum here. 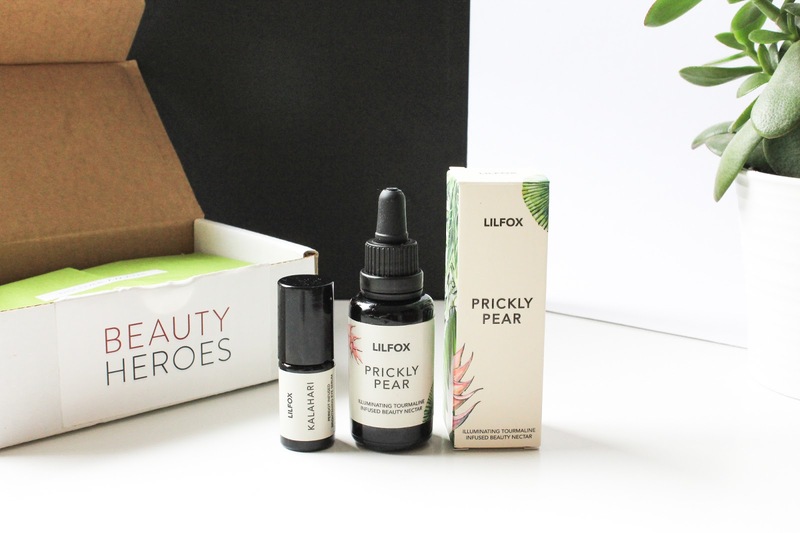 You can get these two LILFOX products in the October Beauty Discovery by Beauty Heroes. This is a subscription box so you will need to buy at least three boxes at a time. The value of this discovery is $144, by subscribing to Beauty Heroes you can get it for $42.95 (see here). When you become a member you also have a 15% discount in The Beauty Store. They have some new brands and products in the store, including Wabi-Sabi Botanicals, Ranavat Botanics, Golde. Get the October Beauty Discovery featuring LILFOX here. You can still get the LEVEL UP Ambassador Discoveries here (blog post here).